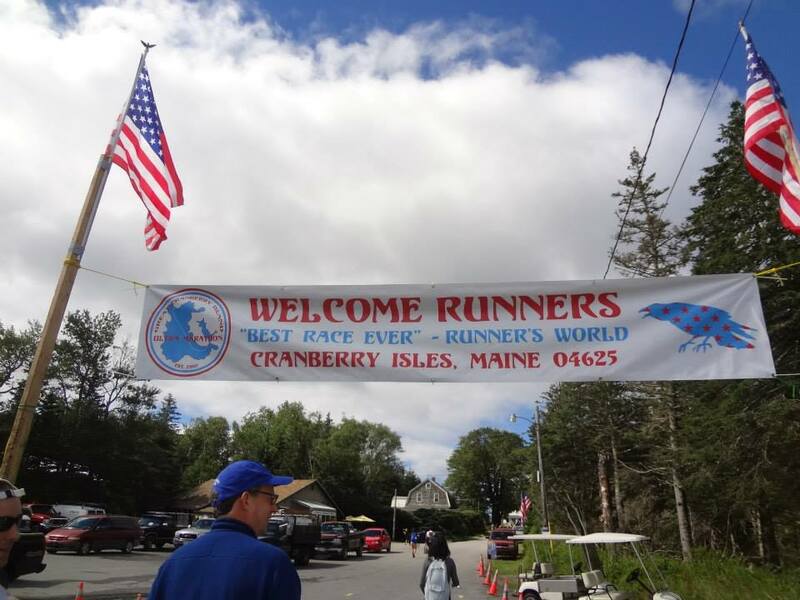 Last year, one of my favorite summer memories was running the Great Cranberry Island 50K in Maine with my friends. This year, I was lucky enough to be one of the 150 people selected to run the final edition of this race (“Best Race Forever” was the tagline) in one of my favorite places in the world! Race Director Gary Allen wanted to end the race on a high note, since he was hosting the RRCA National 50K championships. I drove out to Maine with Shane’s family (I didn’t do the driving, since I’m a city girl…), and we stayed in Bar Harbor the night before the race. It was a long drive, about 7 hours from Central Massachusetts. 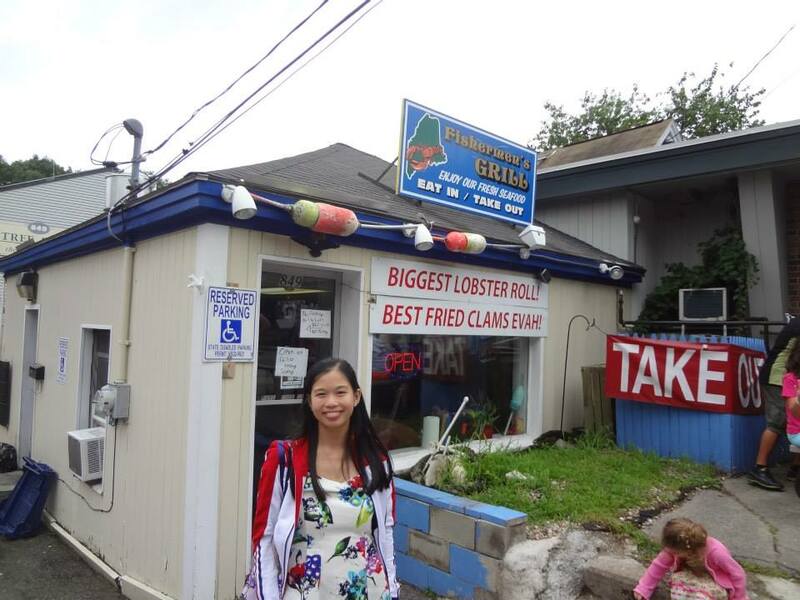 We stopped along the way at my favorite spot from last year, Fishermen’s Grill in Portland for lunch. There was a long line this time, since people apparently came far and wide for their massive lobster rolls. Was it worth the wait? Emphatically, yes! I ordered the New England clam chowder (just the right amount of flavor and salt, with massive chunks of clam) and the lobster roll. The lobster roll was $15.95 market price for a “mini,” which was 1.25 pounds of lobster instead of 1.5 pounds of lobster. There was nothing mini about it. The lobster was so fresh and flavorful I could practically taste the ocean. 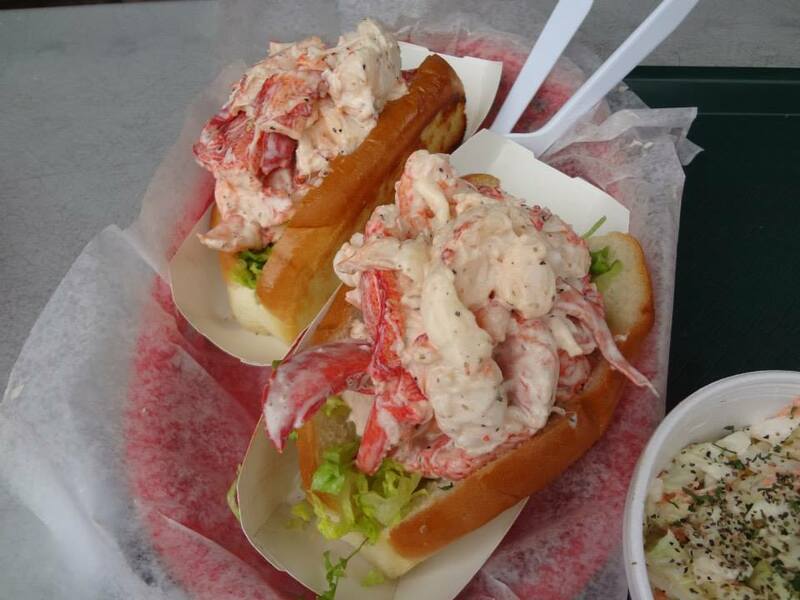 I will never look at an NYC lobster roll the same way again–I have been spoiled for life. For pre-race dinner the night before, Shane and I went to an Italian spot called Mama DiMatteo’s near Main Street. We had the all-you-can-eat pasta (of which I only had a plateful, haha) with meatballs. It was pretty good; I’ve had better, but it was perfect for carbo loading. I also tried the panna cotta with blueberry sauce. The panna cotta was a bit firm (more like cream cheese and less like flan) but the sauce was good. 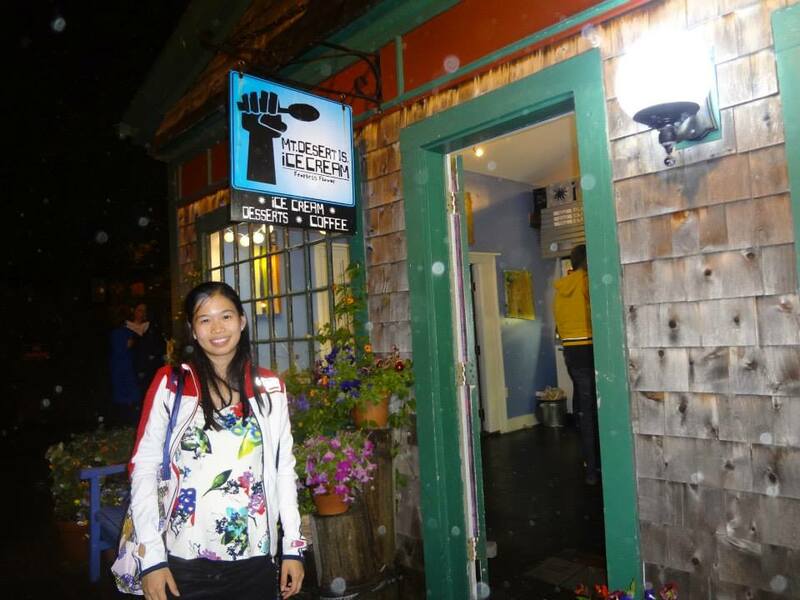 The best part of our food tasting in Bar Harbor was, hands down, Mount Desert Island Ice Cream co. It has a really cool logo and even from the flavor list you can see it was a legit ice cream shop. They had really cool flavors like coconut, salted caramel, and flavor combos that include cookie crumbs. Tasty! I would give it 5 out of 5 stars–that’s how good it was. There was even a photo of Obama visiting the shop, but that wasn’t the only reason why it was good. I was full of ice cream, lobster rolls, and pasta. I was ready for my 50K! The race started at 11:30am on 7/27, which allowed runners more time to get to the ferry in Northeast Harbor. The only way to get to Great Cranberry Island (GCI) was via ferry from two locations off of Mt. Desert Island. We opted for the 9am ferry, which would give us plenty of time but allowed us to sleep after an exhausting car trip. Shane’s family was taking a later ferry to come and cheer. We lugged our bags, tent, and camping gear onto the dock, and luckily the ferry came as scheduled. I ran into my friends Kristen L and Kristen P on the boat, and it was great seeing them because we were both GCI 50K veterans from 2012! The ferry ride over was gorgeous and relaxing. The weather felt perfect–we were going to have an awesome day. We got to the island around 9:40am, and awesome locals helped us drive our luggage 3/4 mile up the road to the campsite. The GCI 50K is famous for its post-race lobster boil and camping, and if you skip out you miss a big part of the race experience. Shane and I picked up our packets at the fire station, and I ran into one of the most inspiring Marathon Maniacs, elite runner Leah Thorvilson from Little Rock, AR. I had met her at the 2011 Little Rock Marathon and she has won numerous marathons! The swag bags were nice–they had a New Balance tech shirt, a commemorative mini lobster claw pin (a mini version of the medal), a metal water bottle, and some Clif bar and gel samples. We pitched our tent on the field behind the community center and got ready for the race. 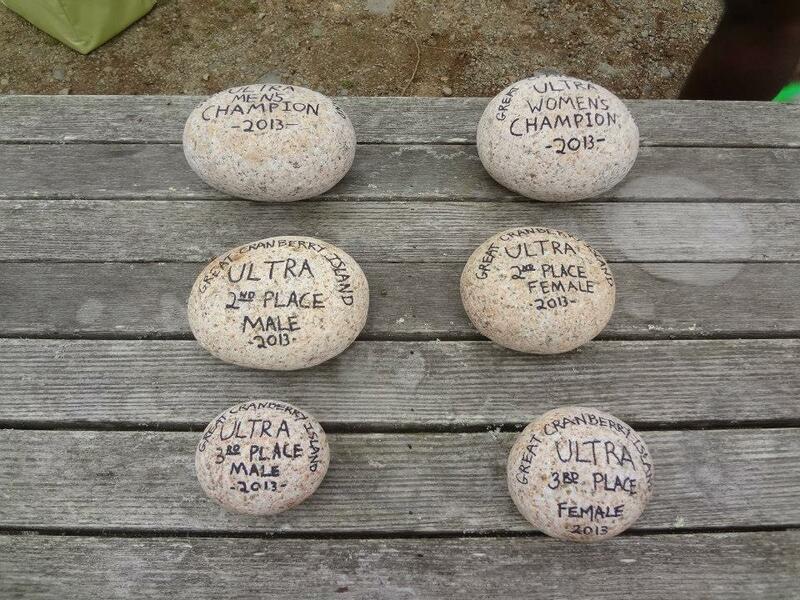 There were many noteworthy ultrarunners at this race, and I knew it would be awesome running among them. I already mentioned Leah, and the other person was Leigh Schmitt, the course record-holder at VT100. My personal goal was to beat my time from last year (6:10:06) and there’s no better inspiration than to avoid being lapped too many times by the elite runners! I was also running in my Team Refuel jersey, and I had my X-1 headphones from my new sponsor, X-1 Audio. I knew I had to represent well! I needed my headphones for this race, since we would be doing 16 laps of the 2-mile stretch of road running down the full length of the island. I was using the X-1 Flex All sport waterproof headphones, which were small and lightweight, and I could stash them in my waist pack if I needed a break from using them. I would still cheer on my fellow runners, but the music would be a huge motivation for me. After the national anthem was played by Mary Ropp (race co-director), we were off! Shane and I ran the first mile together, then I told him to go ahead without me, since I knew I would see him many more times on the out-and-back course. It was great seeing my friends Kathy, Dave, Anna, Hideki, Mary, Julia, Kristen P and Kristen L out on the course. I also met Jennifer from Runner’s World and saw many other Maniacs. When the race progressed, I started talking less and started to wave and smile more. I needed to conserve energy! The race course is beautiful, with views of the mountains of Acadia National Park and quaint houses, but it is repetitive. The rolling hills also seem to get steeper with every repeat. 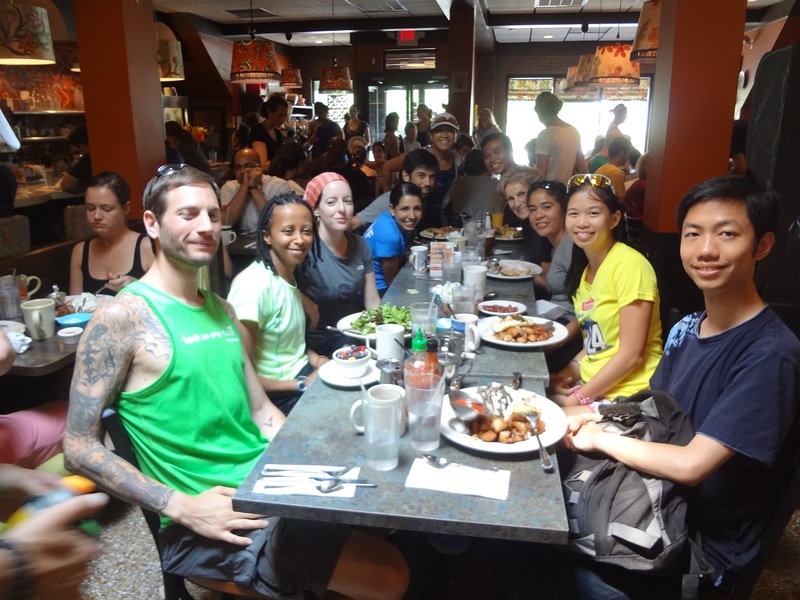 The best part of the GCI 50K is the people. The fellow runners are friendly, the locals set up their own (unofficial) aid stations with boiled potatoes, cookies, and water, and they are a godsend. The official aid stations were staffed by awesome volunteers in bright pink shirts, and they told you that you looked great even when you felt your worst. At the start/finish line, there was also room for drop bags, so I kept one full of bananas, gels and Clif Bars, just in case. There was cola and Gatorade, and everything was kept ice cold. The support was fantastic! I felt pretty good at the beginning, but I was a little frazzled when the gun went off because I was getting ready for the race up until the last minute. I relaxed after the first lap though, and I told myself to be patient and save some energy. Despite the nice weather, the sun was still wearing on me, and so I concentrated on my form and eating enough foods. Shane’s family reached the island after my 3rd lap, and by then Shane was already 2 miles ahead of me. It was relief to see them cheering–it helped a lot. I also took advantage of the potatoes and cookies at the aid stations. The race director also puts everyone’s name on a personal laminated sign along the course, along with funny and inspirational quotes. That helped keep me entertained. My marathon split was around 4:55, so I knew that I was on track to break my PR. The 2nd to last lap was the hardest, because so many people were finishing up and I still had one lap to go! I took down my name plaque/sign and ran with it the last mile. My legs were super tired from pounding the pavement and I willed them to go faster. I had a smile on my face, because at that point I knew I was going to run a PR! I finished in 5:53:38, 17 minutes faster than last year. I was stoked! 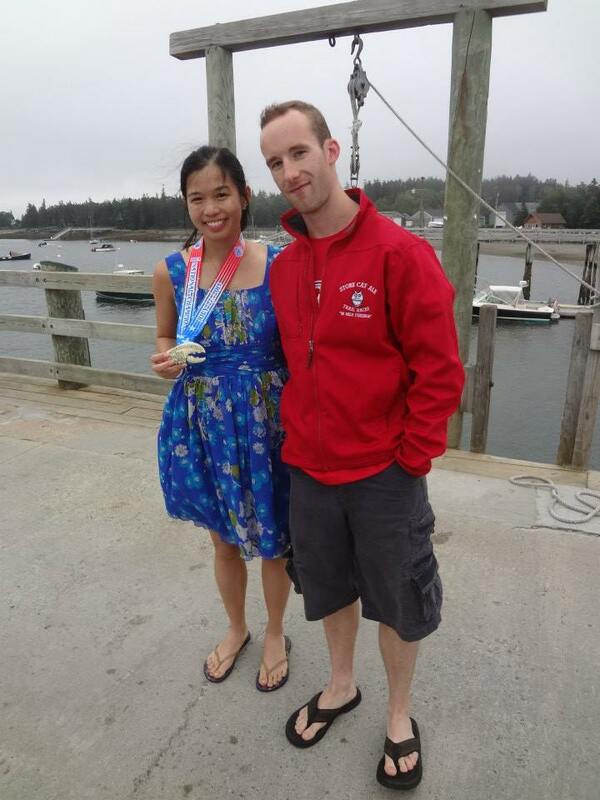 I have definitely earned my lobster (in medal form and boiled form). 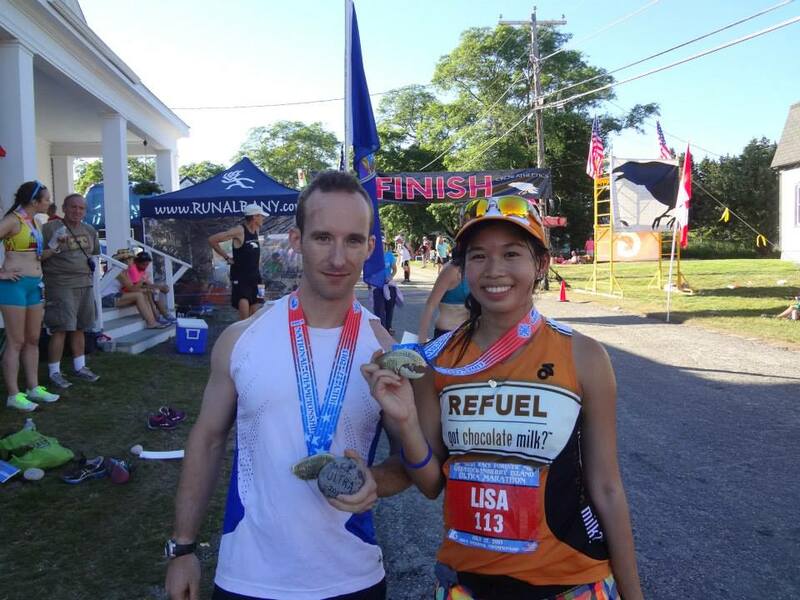 I congratulated Shane on his PR as well, and I made sure to pick up my finisher’s granite rock along with my medal! It was a great day with awesome racing conditions. The race provides rustic showers on the campground, and it was a nice amenity. Before that, though, Shane and I decided to walk to the dock and dunk into the Atlantic Ocean. The water was freezing so I only went in partway, but Shane decided to swim a couple hundred feet out. Yeah, no big deal. It was a good cool-down, at least? As the sun set, the bonfire got started, the lobsters were cooked in waves, and the bugs came out in full force. The only bad thing about Maine is the mosquitoes. The little buggers are vicious. I got bit through layers of clothing! However, I had such a good day that I blocked out the pain. 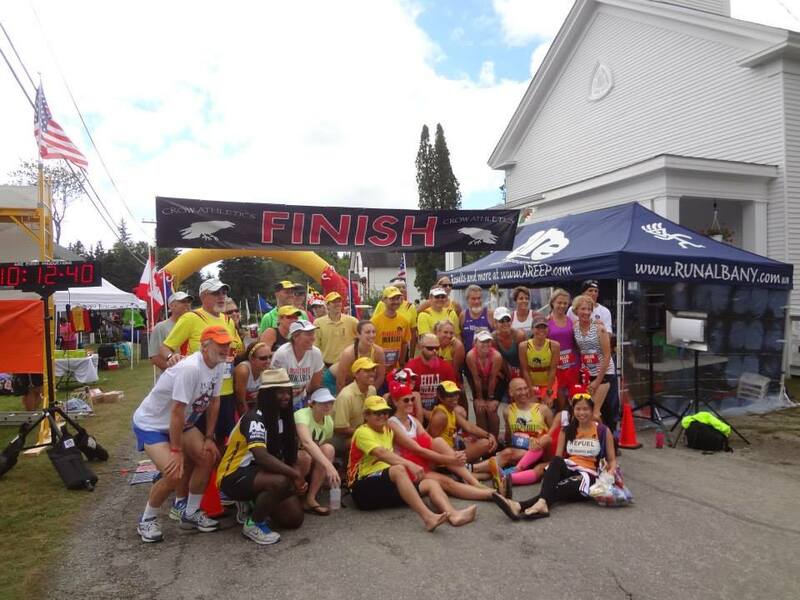 Each runner was served a boiled lobster with butter, corn, and everyone gathered around the bonfire to chat. There was an awards ceremony, and one of the runners, Doug, served as the DJ. It was a perfect night and you could see the stars very clearly. Although my body was tired, my mind was in awe of the beauty of this island. The people are what make it special. 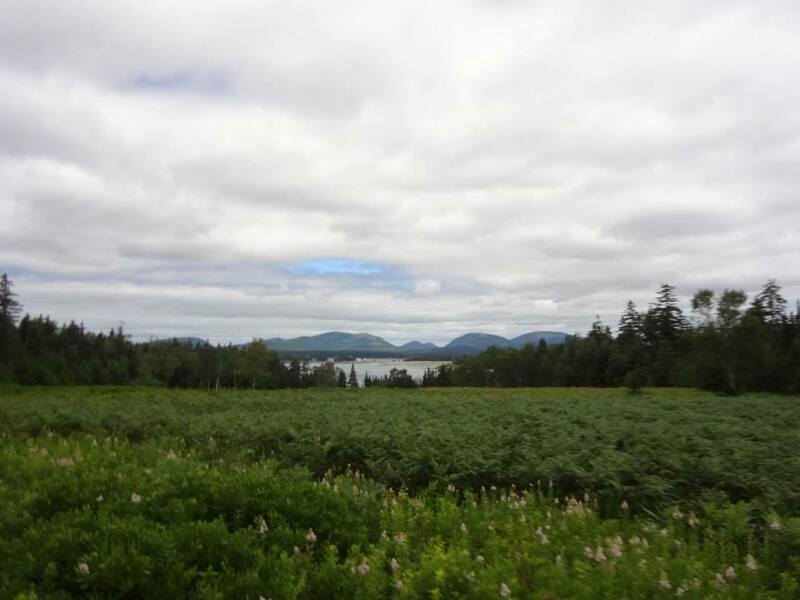 The next morning, we enjoyed a breakfast put on by the Ladies’ Aid Society, strolled on the main road to the Whale’s Rib gift shop (shopped for souvenirs), and chatted with a runner from Paris at the Cranberry General Store. I almost didn’t want to board the ferry to leave so soon! Thanks to Gary Allen and Mary Ropp for putting on such a special race. Thanks to all the volunteers, Shane’s family, and all the spectators for cheering! It truly is the best race forever, and I was glad to be a part of it. 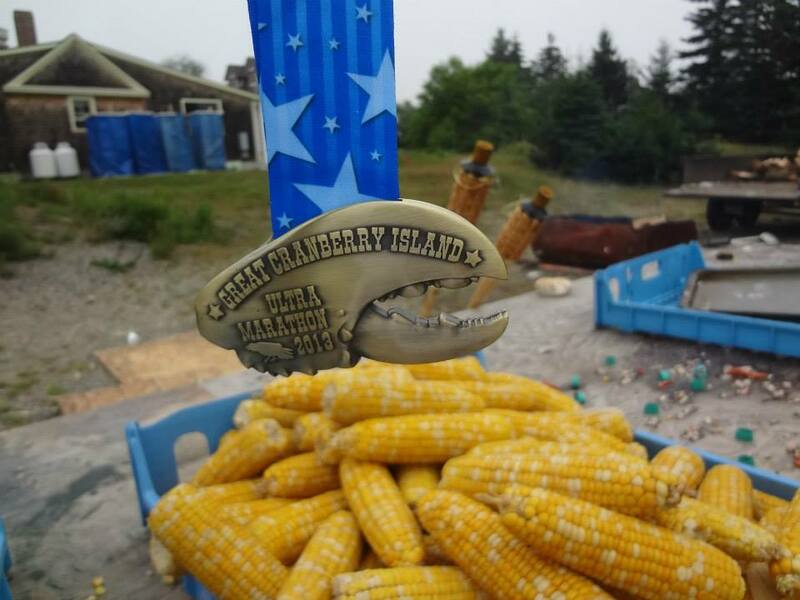 Categories: Uncategorized | Tags: Bar Harbor, Fishermen's Grill, GCI 50K, Great Cranberry Island 50K, lobster rolls, Maine, Mount Desert Island Ice Cream, Team Refuel, X-1 audio | Permalink. I can’t believe it’s been just over a year since I started this little blog. I figured there were others out there just like me who love eating, running or both. I am so grateful to all my friends and readers who have fully supported my journey. I am grateful to my sponsors, Team Refuel/Got Chocolate Milk and X-1 Audio, who provide me with awesome gear, grant money and waterproof headphones not because I’m the fastest runner ever, but because I love running! To follow up, a few weeks ago I was waiting for the bus from NYC to Philadelphia on 7/19/13 (it was 98 degrees in NYC that day, by the way), when I got word that the 20in24 Back on My Feet races were first shortened (to a 12-hr event), then cancelled due to a predicted 110F heat index for Saturday. I was melting into the sidewalk (literally), when I heard this news and I was so bummed. A ton of my friends called and texted me to make sure that I heard before making the trip. In a span of a minute, I considered all my options and made up my mind to travel anyway. Why? 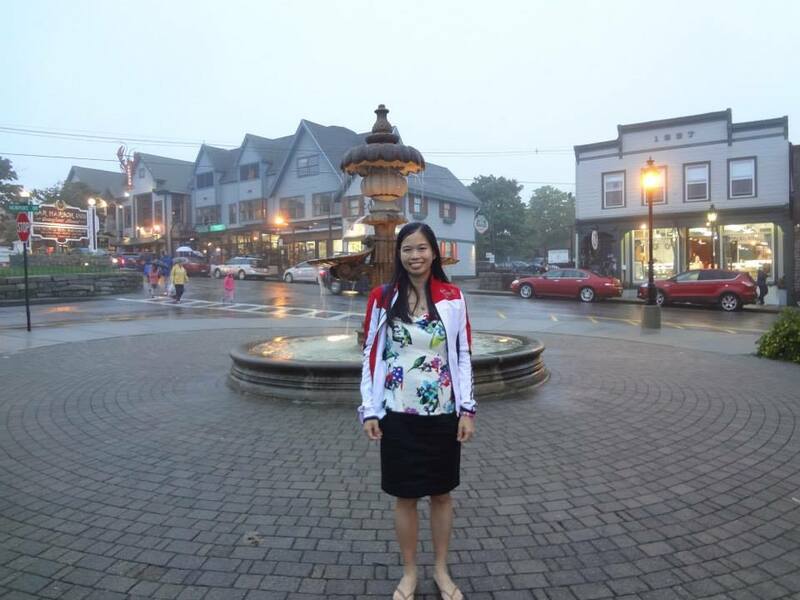 Two reasons: my friends were already en route to Philly, and most importantly, my cousin Jing was making the trip from Nashville to Philly just to cheer me on! He travels a lot for work and he had never seen me run before, but when he heard I was doing this crazy race, he offered to come and cheer. I couldn’t NOT go to Philly and not spend time with my friends and cousin! So the bus arrived two hours late due to traffic, but I was able to make it to dinner at Spasso, where we laughed and cried (not literally, but on the inside) because we were all so sad that the 20in24 races were cancelled. Quite a few of us fundraised $500+ to earn our spots. I was glad that the money still went to Back on My Feet, a great cause, but sad because we had trained hard for this event and the heat would not have deterred us ultrarunners. The next day, Jing and I went to Joe Coffee in Philly, then we met up with my group of friends (Alison, Atsede, Hideki, Rick, Joe, Annette, Scott and Lucy) for brunch at Sabrina’s Cafe and Spencer’s Too. I got the huevos rancheros and they were DELICIOUS. We went shopping at Athleta (yes, sometimes shopping is the best therapy) and Philadelphia Runner. 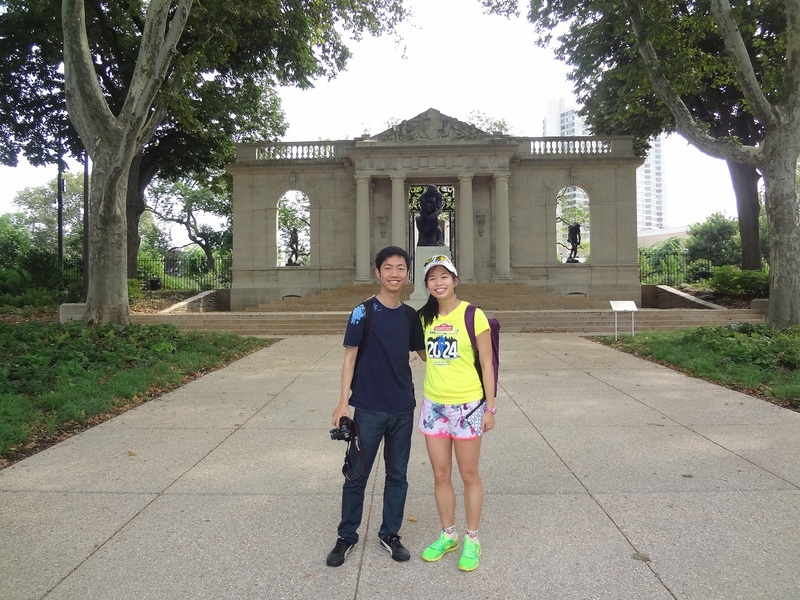 Jing and I decided to go to a museum–we tried to go to the Barnes Collection only to be turned away because you need to make a reservation (who knew?). We went to the Rodin Museum instead, and it was lovely. After, I managed to squeeze in a 2-mile run near Lloyd Hall (yes, it was 95 degrees…but nothing I haven’t run in before) before dinner. Then Jing and I went to an awesome sushi spot near the Best Western before I left for home. I only spent 24 hours in Philly but it was great! 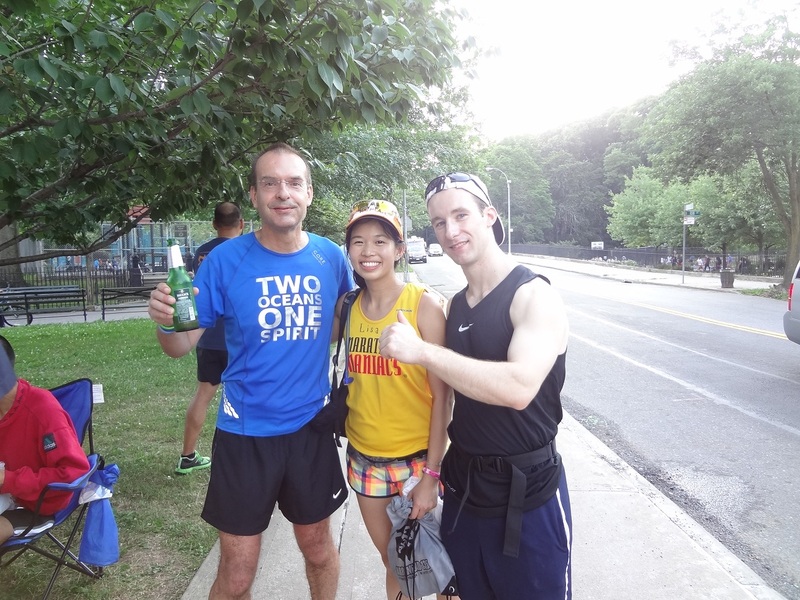 Going backwards in time–it was tough to miss the 20in24 as part of my Bear 100 training (I had aimed to run 80 miles), but I am very glad I got to pace my friend Juergen for his first 100-mile attempt at the Great New York 100 (TGNY 100). 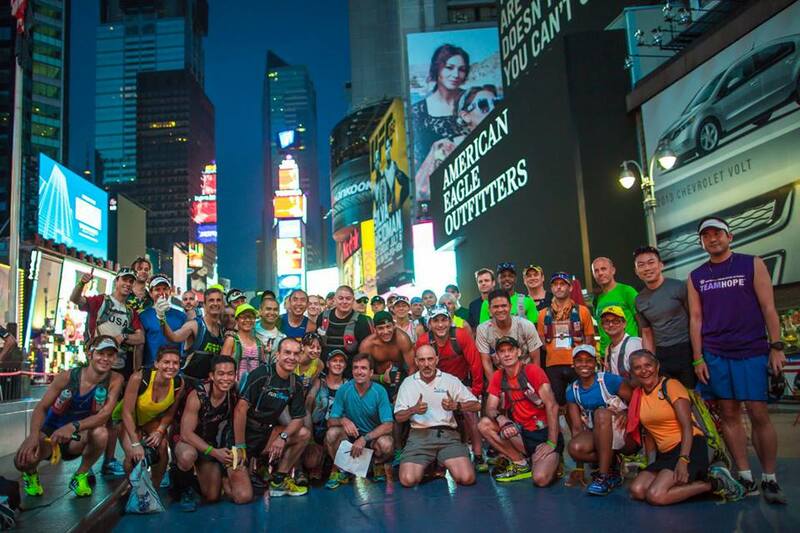 From June 29-30, a group of 50 intrepid ultrarunners ran 100 miles through New York City, almost undetected by the city. A Wall Street Journal article did bring awareness to the event, put on by Phil McCarthy, but for the most part it was a low-key event. 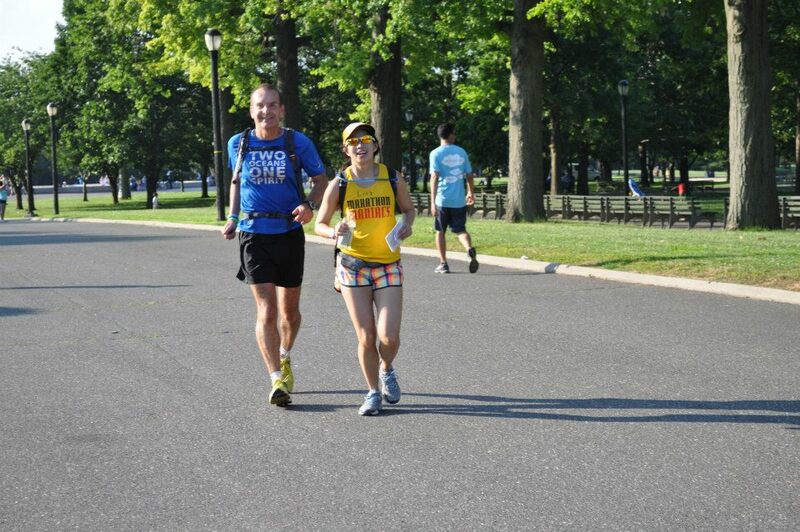 My friend Juergen came all the way from Munich for this 100-mile run, so I wanted to make sure he succeeded! The plan was that I would pace him for 26 miles, then Shane would take over and pace him for 38 miles starting from the 100K mark. It was a crazy day for me–Shane and I went to the start line in Times Square at 4:30am to see the runners go off at 5:00am. I then went to Central Park at 8:30am for the 5-mile Pride run, ran that, went to work to pick up my running supplies, then met Juergen in Astoria at mile 37 so I could pace him. Then I went to work the next day. Whew! It was so worth it–the ultrarunning community is extremely supportive and I wanted to play my role to support the TGNY 100 runners. Juergen was extremely positive even when temperatures reached 90 degrees, and I joked at one point that he might have to carry me on his back and I would go down in legend as the worst pacer ever. (I took some walking breaks while Juergen took hardly any breaks) One of my favorite parts of the run was at Wide Water Marina, where my friends Becky, Steven, Ray and Bee were manning an aid station. They filled our bags with ice and gave us cookies and PB&J. It was awesome. My job was to make sure that Juergen stayed hydrated, and I held the directions that gave turn-by-turn instructions. Luckily, we didn’t get lost. Every time a runner passed us we gave encouragement. I also loved running through Alley Pond Park, where Atsede, Annette and Joe were volunteering at an aid station. Juergen was strong approaching the 100K mark, and Shane ran to meet us at Forest Park to make sure we didn’t miss the aid station. I knew Juergen was in good hands. He ended up running a negative split, and finished in 6th place overall with a time of 23:15:24!! I was so proud of Juergen and our pacing team. Who says that running isn’t a team sport? 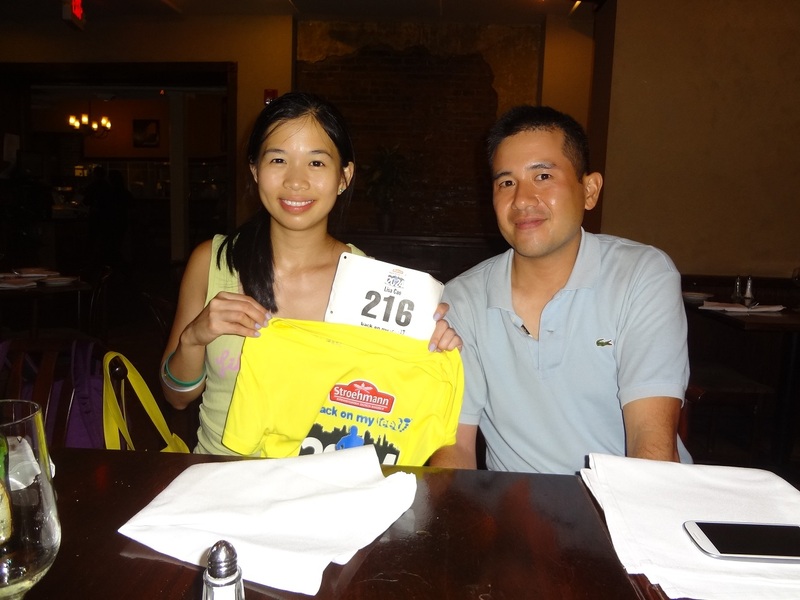 My friend Tommy was the overall male winner, and Sky won the women’s division in her 100-mile debut. Congrats Sky, Juergen and Tommy! Also, congrats to my friends Shannon, Otto, and all runners who finished the 100 mile or 100K races. After the race, Juergen and our friend Otto went home to NJ to nap, then I met up with them for a post-race celebration at Qi, a Thai restaurant. I surprised Juergen with a mini-cake to celebrate his first 100-mile finish, and Becky and Otto joined us for the celebration. A few weeks later, Juergen sent me a surprise in the mail for my birthday. 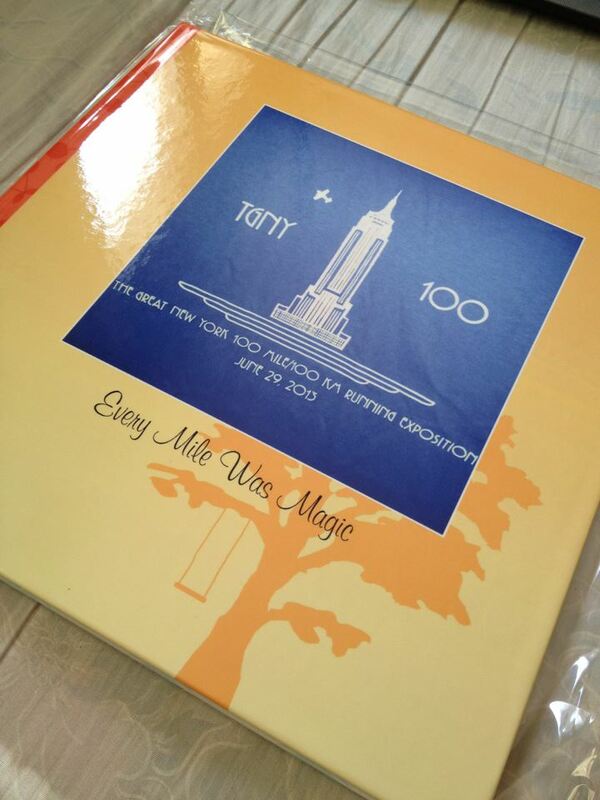 It was a beautiful scrapbook commemorating the TGNY 100 run, filled with photos of the two days taken by friends and other spectators. It was one of the best gifts I have ever gotten. Thanks Juergen! I am proud to be your friend and pacer (and hydration manager). 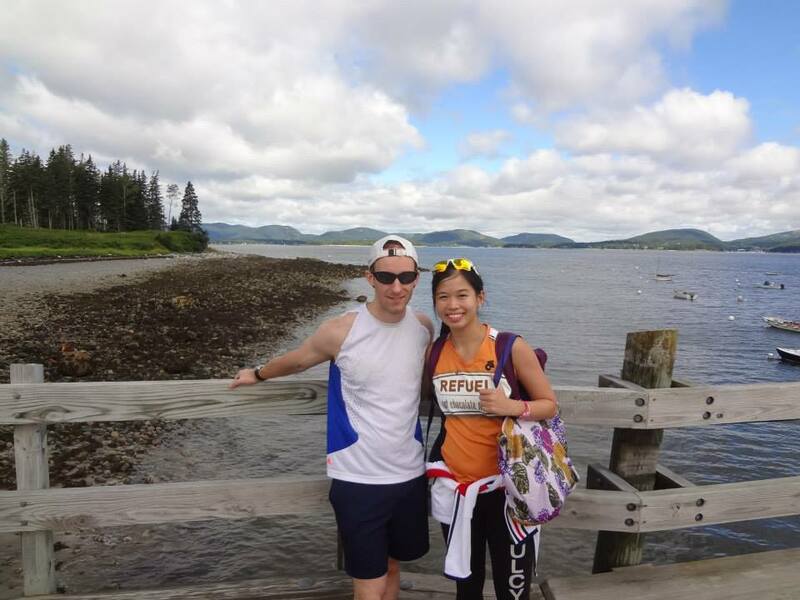 Categories: Uncategorized | Tags: 100 miles, 20in24, Back on My Feet, Greater New York 100, Qi restaurant, Sabrina's Cafe and Spencer's too, Team Refuel, TGNY 100, ultramarathons, X-1 audio | Permalink.